Your organisation may be staffed by incredibly skilled, experienced and innovative individuals, but in order to utilise their stregths you need to give them the resources to work seamlessly on projects, not to be held back and demotivated by inadequate communication channels and time-consuming resource sharing. Invotra provides a space and tools for collaboration, a staff directory to ensure communication is simplified and rapid and social networking features to encourage team building and strengthening, even across a disparate team in a larger organisation. 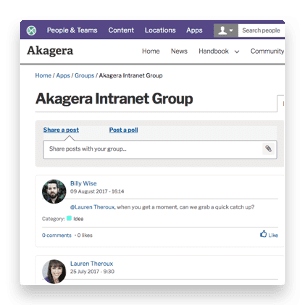 Using our Groups application offers teams a space to share ideas informally, store important documentation and collaborate on content in Group docs. Through informal discussions in groups, sharing experiences in blogs or sending good will messages on our Message Wall, Invotra provides the tools to overcome silos, hierachies and team divisions. Our People staff directory allows staff to quickly identify colleagues across teams, role grades and locations who may be able to offer help needed in a specific project. Saving time on sharing documents by email or an external application Invotra groups allows any user to set up a team of individuals who may not be in the same department. Providing a workplace where they can search information easily, and tools to collaborate on documents, set tasks, comment and set up group discussions areas to share information and work together to achieve mutual objectives. Invotra gives you a range of options allowing you to have a mix of private and public spaces. Collaborators get all their updates to their individual workspace so they are up to date with the progress. 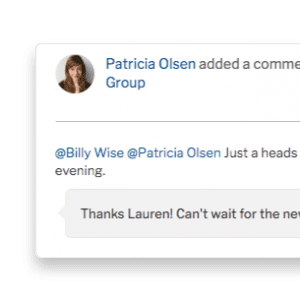 Groups – Give your users the power to create self organising digital conversations, initiating discussions with individual posts, replying and interacting with others who have posted, and collaborating on content using Invotra Group Docs. Feed – Keep users up to date with all the latest relevant activities and communications from colleagues, teams and groups. Message Wall – Share instant micro-news updates with your colleagues using Invotra Message Wall. People – Our People staff directory allows users to identify colleagues acros teams, role grades and locations with the skills and experience needed in projects, using simple searches and self-administrated profiles.